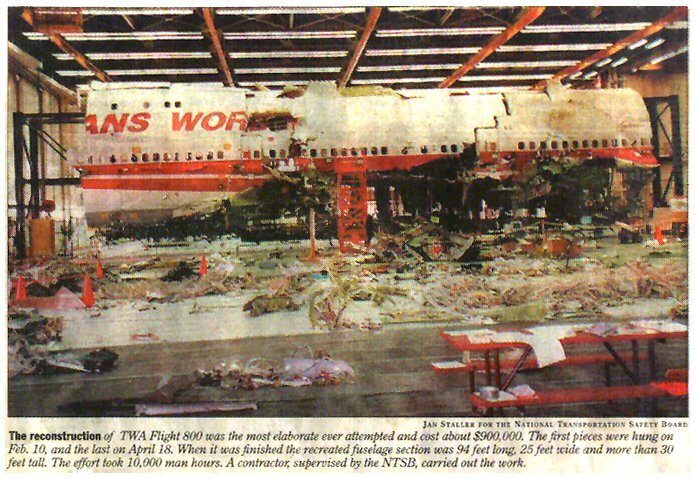 Ten years ago, Trans World Airlines Flight 800, a Boeing 747, exploded minutes after takeoff and plunged into the Atlantic. Debris from the crash was dredged from the ocean floor, and substantial portions of the plane were reassembled. Five years ago, American Airlines Flight 77 flew into the Pentagon; and United Airlines Flight 93 exploded in an abandoned strip mine near Shanksville, Pennsylvania. In each case, the crash site was seemingly well defined. 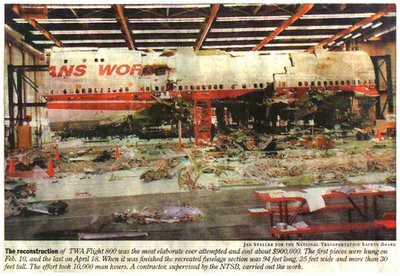 The remains of Flight 77 in particular should have been relatively easy to recover since the plane was inside a building. To date, no photos of either plane under reconstruction have surfaced. The 9/11 crash investigations were controlled by the F.B.I. The National Transportation Safety Board has not and will not issue reports on any of the planes involved in 9/11.